We can’t change history, but we can change the future. Following a lot of suggestions, Inline Code Finder is available both as a stand-alone version and as an add-on to the excellent Firebug. This means that for all of you who wanted it integrated into your regular workflow with Firebug have a new tab for Inline Code Finder. The stand-alone version shows up in the status bar of your web browser window, while the Firebug version integrates into the existing Firebug installation and is offered as another panel, with its own command buttons and settings. Shows as a separate Firebug panel with a summary, functions and options. Find your settings through Tools > Add-ons, choose Inline Code Finder and click Preferences. 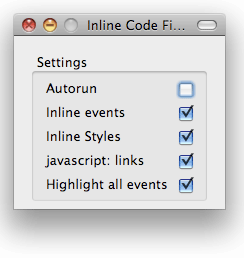 Click Options in the Inline Code Finder panel for Firebug, and you will be able to choose what to check for. To be able to work with this tool, it supports a keyboard shortcut to swiftly toggle on and off the Inline Code finder: Cmd + Shift + Option + I (Mac) and Ctrl + Shift + Alt + I (windows). Use it now – test your score! So now you know what I will definitely check for if you ask me to review a web site. 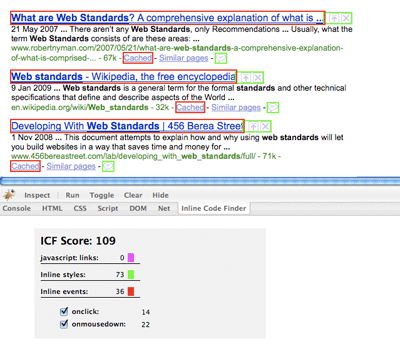 Inline Code Finder also offers a total ICF Score, which is meant to be of some guiding to how many things you need to take care of in the code, and the overall code quality and level of separation. Thanks for the great plugin. One problem that I’m not sure you caused, but only started happening when I installed the firebug plugin: every time I refresh the page and Firebug is open it switches to the Inline Code Finder. Do you know of any way of stopping that behavior? Thank you! Actually, that is my fault. I’ve solved the issue, and it will be pushed out in a new release, coming very soon! Therefore, anyone, just install the current version, and that specific issue will be gone in no time. Thanks Robert, another great tool! Good work! Ok, just wanted to say that a new version has been released of the Firebug version, addressing the above-mentioned issue. In Firefox, go to Tools > Add-ons and click Find updates. Thanks Robert for this addon! Works smoothly, and my — what site’s sitebuilder I’m — has ICF Score: 1. As a Firebug plugin, like YSlow — where livesex.com passes with a Score: 89 (because of a lack of CDN) –, improves my work, and my works quality. Glad that you like it! For anyone else: Adam’s web site isn’t exactly child-friendly, as you might have already guessed (just so you know what happens if you click on his name). uups, sorry! If you feel, please, remove my site’s url from my comments! Excellent tool Robert!!! I especially like the Firebug version. A great way to integrate new tools into an established work flow. On the other hand, for people who scrupulously followed the separation rules there never was any need for this. Guess that’s why nobody bothered. Keep up coding such handy tools! Interesting that you bring that up, I'll take a look at it! Your tool doesn’t work for me on Firebug. It does nothing. It doesn’t appear to do anything. Using FF 33.0.3, FB 2.0.6. 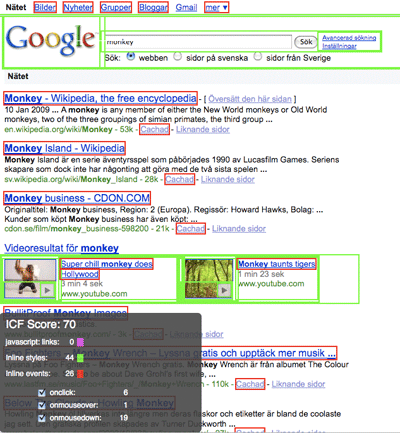 I see nothing at all in the ICF tab in FB. All boxes are checked in the dropdown. Any ideas? Yeah, you’re right, it seems to have stopped working. Not sure exactly why that is, haven’t updated it in years. For now, if you need that functionality, i recommend the standalone version of Inline Code Finder – just tried it and it works. © Robert Nyman, unless stated otherwise.